I want to view some content from the lesson, but I don’t want to re-do the challenges, what do I do? If you just want to review the vocabulary and grammar from the lesson without the challenges, click on the lesson again and select ‘FlashCards.’ In the FlashCards area you will be able to view all of this content by selecting the ‘Words’ and ‘Grammar’ options at the bottom of the screen. 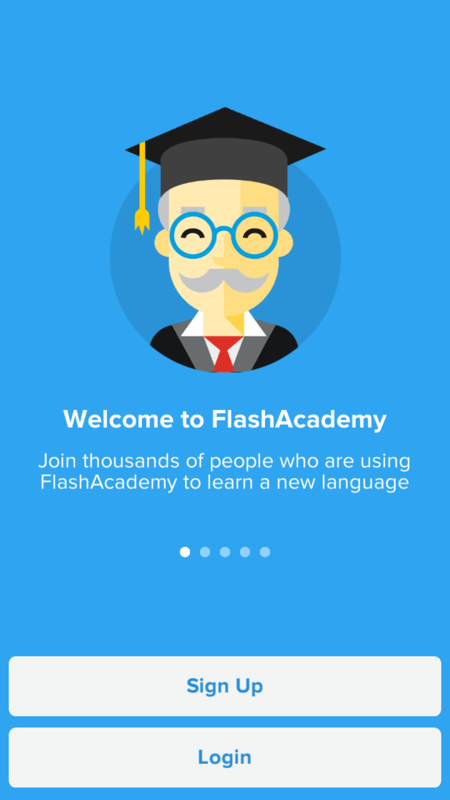 To download the app, simply search for ‘FlashAcademy’ on the App Store or Google Play Store. Hit download and you’re ready to start learning! Can I study more than one language? How do I switch to another language? Yes, you absolutely can study more than one language. 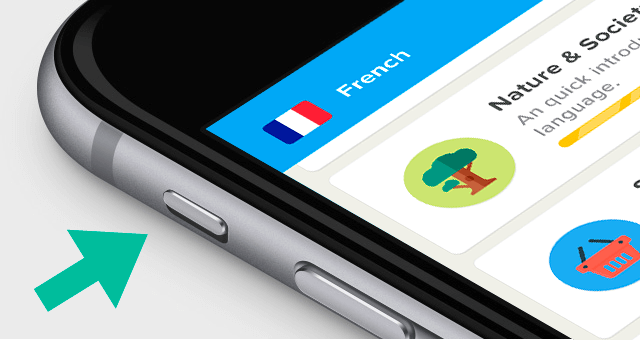 Our full language courses are available in French, Spanish, German and Italian; Premium provides you access to all content across all languages. 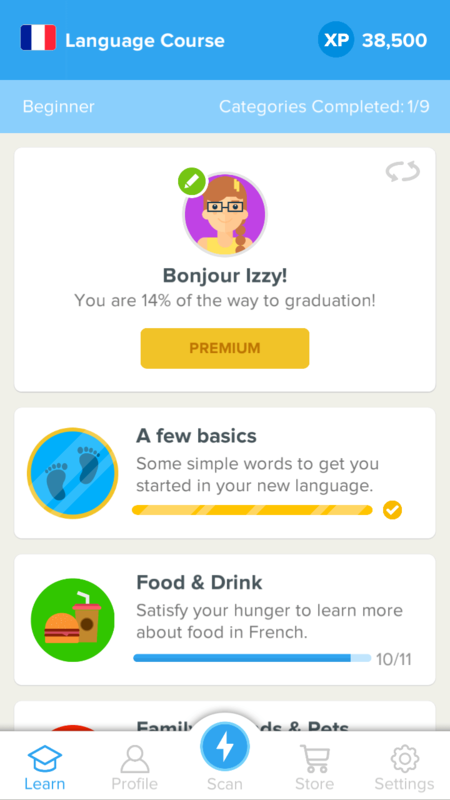 When you wish to select a different language to learn, simply go to ‘Language course’ on the top left of your screen, and you can then select another language from the options. Yes, FlashAcademy can be used without internet connection, provided you have downloaded the categories using wi-fi first. Please note that if you are in offline mode, you will be unable to access the Object Translator, view the Leaderboard, watch Videos or complete the Speaking Challenge. How can I upgrade my subscription from 1-month to 12-months? To change your subscription plan, you will need to cancel your current subscription. Firstly, go to Store > Manage Options to cancel. 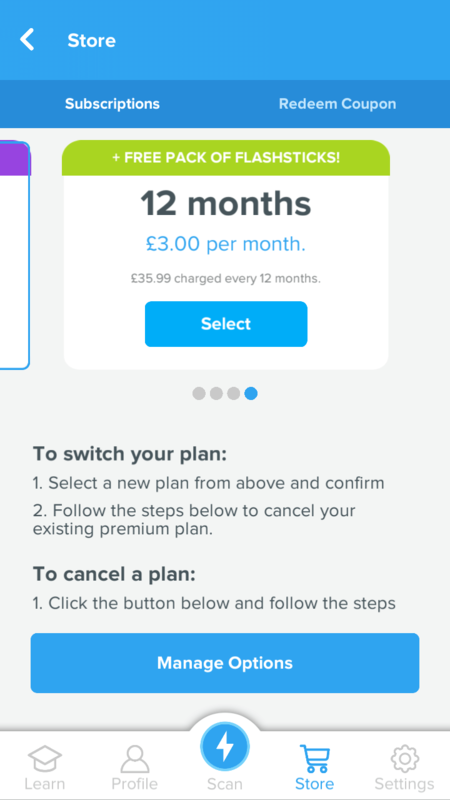 Then you will also need to cancel the old plan through the App Store or Google Play store (links in previous answer) and re-subscribe to your preferred new plan. Don’t worry, you won’t lose any of your progress! The sound on the app isn’t working, how do I fix it? 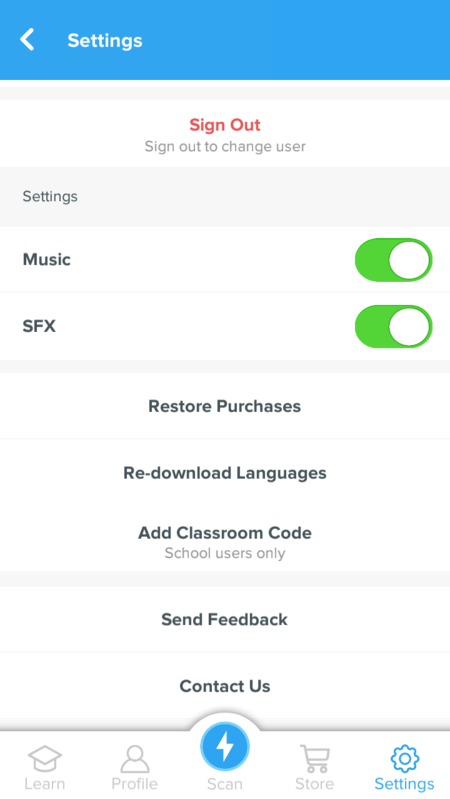 For the audio to be able to work on the FlashAcademy app, your device needs to be switched on to ‘loud’ mode. For iOS devices you will need to flick the side switch up and turn the volume up using the control panel at the bottom of the screen. Don’t worry if you’ve forgotten your password – we’ll get you back up and running in no time! Just contact team@flashsticks.com and tell us which email address you’re signed up with and we will reset your password ASAP. 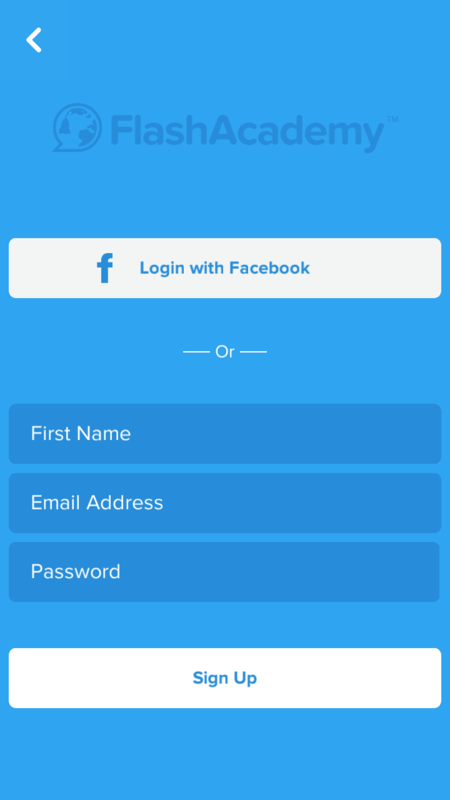 You can either sign up to the app using your email address or Facebook account. If you sign up with your email, you will also be asked to create a password, which you will then need each time you log in. Alternatively, you can sign up with Facebook if you have an account. To subscribe to Premium, simply go to the ‘Store’ section (you’ll see this at the bottom of the screen), and select the plan you want to purchase. Once you select the plan you will be asked for your iTunes or Google Play password and the payment will be processed through your account. Why would I choose the 12-month subscription option? This option can save up to $59 per year, whilst allowing you to commit to a single yearly payment versus 12 monthly payments. This is the most cost effective option and at the moment we’re offering every new 12-month subscriber a free pack of FlashSticks Notes. I want to cancel my subscription? How do I cancel? 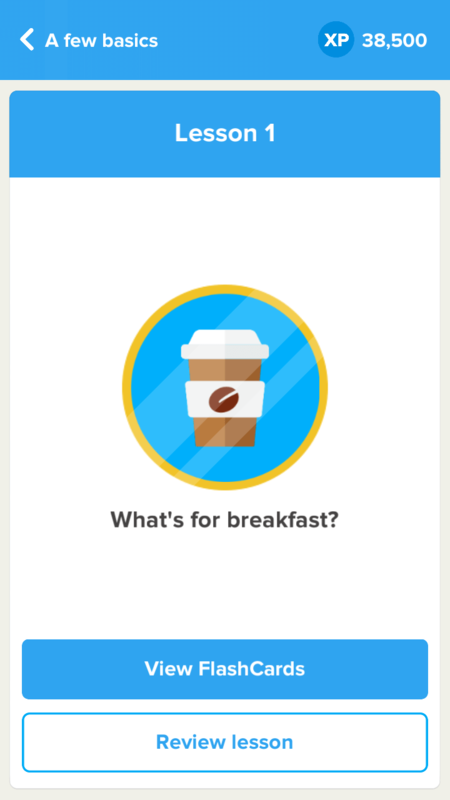 I’ve bought a subscription but the lessons are still appearing as locked, how can I unlock them? If you have purchased a FlashAcademy subscription and are unable to enter the locked lessons, go into Profile > Settings > Restore Purchases. You may also need to check your subscription status on the App Store/Google Play Store to make sure the purchase was successful.